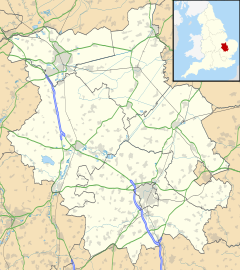 Wothorpe is a village and civil parish in the Peterborough unitary authority of Cambridgeshire, England. It is in the far north-west of the district, and to the south of Stamford (in Lincolnshire). The parish borders Northamptonshire on its west. Wothorpe Priory was a "small Benedictine nunnery", founded apparently around 1160. All but one of the nuns died in the outbreak of Plague in 1349, with the survivor becoming part of the Priory of Stamford. The property was dissolved by Henry VIII, being granted to Richard Cecil. As a parish, it was considered a hamlet within the parish of Stamford Baron, becoming a separate civil parish once more in 1866. Historically the parish was part of the Soke of Peterborough, associated with Northamptonshire. Administratively, it became part of the Stamford rural sanitary district in the 19th century, then later the Barnack Rural District of the administrative county of the Soke, then passing to Huntingdon and Peterborough in 1965 and Cambridgeshire in 1974 under the Local Government Act 1972. The early-seventeenth-century Wothorpe Towers was a lodge that was once part of the Burghley estate, built by Thomas Cecil, 1st Earl of Exeter, eldest son of William Cecil, 1st Baron Burghley. After Thomas' death, the Towers were leased to George Villiers, 2nd Duke of Buckingham, then used as a dower house and finally, part dismantled to provide an eye-catcher in the newly landscaped park. The whole historic site was purchased by the Griffins in 2004 - after carrying out extensive works to remove the building from the Heritage at Risk register, the family have placed the monument in the care of the Wothorpe Towers Preservation Trust, and are restoring the gardens and surrounding buildings, which are now their home. Within the parish of Wothorpe is the highest point of the historic Soke of Peterborough. The high point of 81 metres (266 ft) is located on Racecourse Road at TF 0353 0417, next to the county boundary with Northamptonshire. Although unmarked, the summit is of interest to participants in hill bagging who visit these high points of the historic counties of England. ^ Simon Edwardes (2001). "Racecourse Road". The Mountains of England and Wales. Retrieved 20 May 2014. This page was last edited on 25 February 2018, at 11:24 (UTC).